In Wisconsin, deer hunting is a strong tradition that reaches almost religious levels for some people. Every fall, the woods in Wisconsin would fill with men and women dressed in blaze orange as they hope to bag the big one. It's the only time that Lambeau Field, home of the Green Bay Packers, is filled with orange instead of green and gold. But in recent years, the number of hunters - and the number of deer harvested - has been dropping. 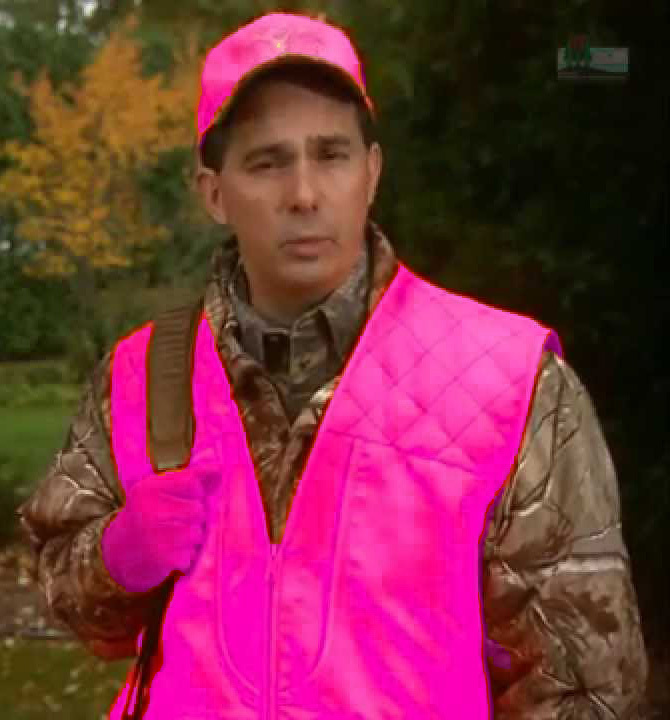 It could be because Scott Walker and the Republicans have jacked up the cost of hunting licenses. It could be because Walker's hand off approach to the spread of Chronic Wasting Disease isn't working. It could be because of the fact of dropping number of people, it's becoming even more dangerous to be out there. Ah, but Walker and his buddies have just the solution to cure all our woes! Walker privately and secretly signed a bill into law which would allow people the option of wearing hot pink instead of blaze orange. When these geniuses first came up with the idea, they tried to sell it as the way to get more women involved in hunting and boost the economy. The bill's authors, Reps. Nick Milroy, D-South Range, and Joel Kleefisch, R-Oconomowoc, maintain that the measure will encourage more women to take up hunting, give hunters more clothing options and give apparel manufacturers a boost. Yeah, because I lost count of all the women that have told me that they would love to go out in the woods, maybe get shot or catch a horrible disease, but they just didn't want to get caught in that tacky orange. I guess it's easier for Walker and company to deal with these kinds of distractions rather than get to work on fixing the economy they've trashed, repairing the damage they've allowed to our environment or, y'know, getting around to creating those 250,000 jobs Walker promised us all those years ago. This season there will be a further screwing down of doe tag use as the tag you get with your bow license will no longer be valid for the gun season as before. Already antlerless tags have gone from $2 to $12. While previously they were good in any zone where a doe season was in place (most of the state) in 2015 they were only good in one county and then specific to either public or private land, not both. Since there were only 150 public land tags issues here hunters without access to private lands cant hunt does anymore unless they score one. The explanation given for this is that "Cheap (or free) doe tags DEVALUE THE EXPERIENCE!" FYI: Issuing these tags is the one and ONLY deer management tool available to committees. At the same time there is no county by county deer population count data available on which to base the decision. Except that you are wrong. There were more licensed deer hunters in 2015 than 2014. So your silly narrative in wrong. Go ahead and see it yourself. Which is still very low compared to years before. So no, it is you who are wrong. Haha, I cite facts showing an increase in hunter registrations from 2014 to 2015 and you call it wrong. Wow. Good luck with that world view. a slight increase in a downward trend is meaningless. unless the increase is sustained to the point of at least nearly meeting g previous levels, it’s a net loss.